These elegant statement rose gold aluminium heart earrings on long earwires are lightweight and perfect for accessorising your Autumn Winter day to evening look. Elegant and understated the statement earrings are super - lightweight so you won't know you are wearing them! Wear all day and evening. 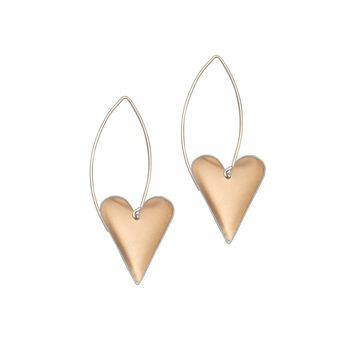 A unique contemporary piece to add to your jewellery collection: beautifully hand cut and domed brushed aluminium hearts on long handmade sterling silver earwires. The earrings make a wonderful treat for yourself ! They would also be perfect to wear for a Summer wedding, on holiday or as an anniversary gift.